Argentina's new government will not appeal court's decision to strike down deal with Iran over 1994 bombing of Jewish center. 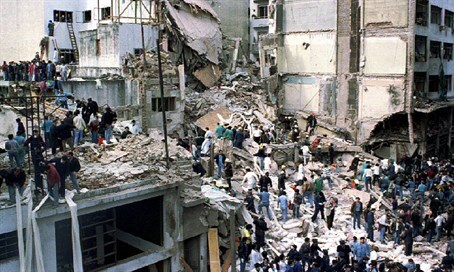 Argentina's new government will not appeal a court's decision to strike down a deal with Iran over investigating the 1994 bombing of a Buenos Aires Jewish community center, The Associated Press reports, citing a government source. The country’s new President, Mauricio Macri, who took office on Thursday, is considered to be more pro-Israel than his predecessor, Cristina Fernandez, whose government had signed the agreement with Iran in 2013 and was planning to appeal the ruling. The memorandum of understanding would have created a joint "truth commission" made up of five independent judges from third-party countries to investigate the bombing. It would also have allowed for Iranian suspects in the case to be questioned. Argentina charges that the Hezbollah terror group carried out the attack under orders from Iran. Tehran's clerical regime denies the charges. Argentine laws forbid trying suspects in absentia and Fernandez always maintained that, given these limitations, the memorandum was the only way to confirm whether Iran's government was behind the attack, as Argentine prosecutors have alleged. Leaders of Argentina's Jewish community, which at 300,000 people is the largest in Latin America, have criticized the accord. The American Jewish Committee, noted AP, compared it to "asking Nazi Germany to help establish the facts of Kristallnacht." A government source, who is familiar with the matter but declined to be named, told AP on Friday Buenos Aires would issue on Monday a news release making it clear it accepted the court's decision and would not seek to revive the deal. "This news is excellent, not only for the DAIA (Argentina's leading Jewish association) but also for Argentine society," DAIA President Julio Schlosser wrote in a statement quoted by the news agency.